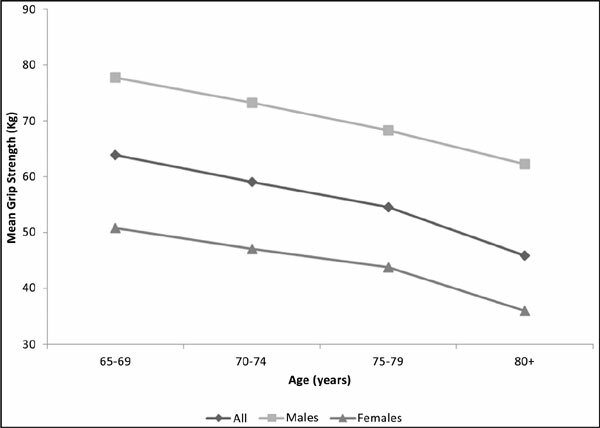 Background: Muscle strength is a sensitive indicator of morbidity and mortality in older adults. Loss of muscle strength contributes to a decline in physical functioning. Hand grip strength is a simple measurement but correlated with total body muscle strength. This study evaluated the patterns and correlates of grip strength among older adults in the United States. Method: The grip strength data were analyzed from the National Health and Nutrition Examination Survey. Result: Individuals (n=1009) aged ≥65 years old who had a grip strength measure were included in this analysis. Age distribution was 31.5%, 27.2%, 16.2%, and 25.0% for 65-69, 70-74, 75-79, and 80+ respectively. Race distribution was 81.1%, 8.3%, 7.1%, and 3.5% for Whites, Blacks, Hispanics, and Asians respectively. The mean grip strength was 71.7kg in males and 44.6kg in females, and declined as age increased (p<.0001). Blacks had the highest grip strength, followed by Whites and Hispanics, and Asians had the lowest measure (p<.0001). Although several variables were found to be correlated with grip strength univariately, after adjusting for gender, age, and race, the factors that remained significantly and independently associated with weak grip strength were lower body weight, not being in good health status, and physical limitations. Conclusion: Grip strength reduced as age increased. Blacks and Whites displayed higher grip strength than Asians and Hispanics. General health status, weight status and physical functioning were independently associated with grip strength. These findings suggest that grip strength could be a useful indicator for overall health assessment in older adults. Keywords: Muscle strength, muscle strength loss, aging, physical limitation, mortality, grip strength. Keywords:Muscle strength, muscle strength loss, aging, physical limitation, mortality, grip strength. Abstract:Background: Muscle strength is a sensitive indicator of morbidity and mortality in older adults. Loss of muscle strength contributes to a decline in physical functioning. Hand grip strength is a simple measurement but correlated with total body muscle strength. This study evaluated the patterns and correlates of grip strength among older adults in the United States.